If the fonts have become squares, press 'R' to refresh the screen. First, I mean thanks for this quick release!!! When will Blast Magician, Defender the Magical Knight and other spellcaster/spellcaster support cards be added? Me main deck focuses on spell counters magicians and most of the monsters and support cards for them are out. May I use your version for a Russian translation? The original version lags and gives errors all the time. Can you add Burning Skull Head , Skull Flame and Supersonic Skull Flame plz X_X ?!? tan nks percy your note is 10! wow ,wow and wow. Nice job percy ,keep up the good work. ^Added options to enable/disable sound and music in the Settings tab. BTW where is the Setting tab? oh crap .. still ... wher is that f..cking RIRYOKU STILL ?!?! 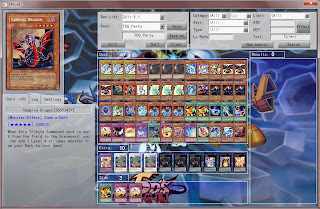 --_--"
if you make a funny deck which is included forbidden cards, it gives an error. we ve wried it a lot of times with a lot of way but nothing happens. it gives still errors. please fix it or make a feature for that. btw make a cool theme. this one is a lil bit complicated and it makes eyes tired while dueling etc. I have enabled sound checklist. please add NPC for this game.. Some sounds sound funny (turn change), better replace them from tag force. Defender wasn't in the last version (0x1020) and I didn't see him or the other cards I needed in the changelog. But still, Blast Magician is still out of the game, and a few other minor spell cards too. I will fix that. Thanks for reporting! Search for "Striker". For the millionth time the search is case sensitive. why the game sometimes get bug when i SS ? Is there a way in this game to fight against an AI? 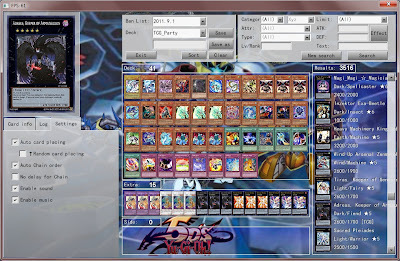 I want the game YGOpro was given a place to chat window. It is much better, if his game is there NPC. 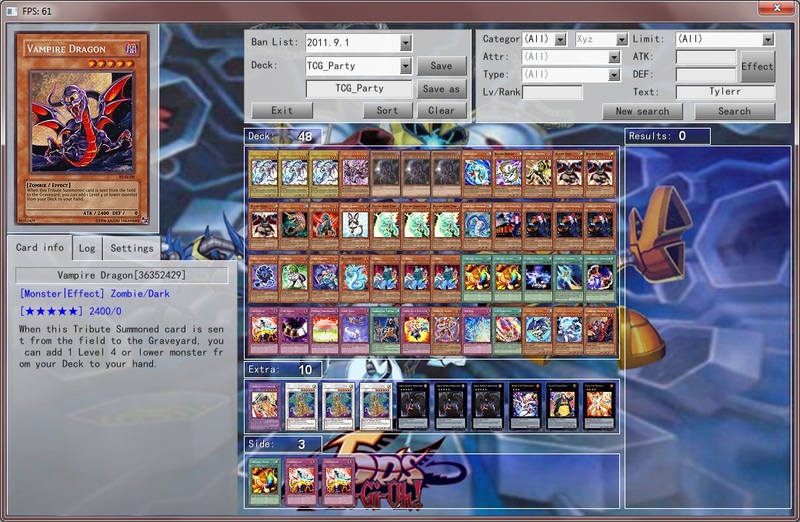 and if you can give a place to chat window when the current YGOpro fellow duelist duel. when I want to special summon from the graveyard. the state must direct traffic. this bug version. now my YGOpro is fine. When I use Monster Reborn and I have lots of monsters in the grave, it won't let me see past the first 5 in the graveyard, how do I scroll through the graveyard? My opp atk with REDMD and lightpulsar, I active mirror force. then, Lightpulsar's eff active ss REDMD, then, REDMD active eff ss Lightpulsar => 2 monsters atk again. BUG 1: The game doesnt allow to use Hushed Psychic Wizard'd effect to remove a Psychic type monster from grave after I used Pot of Duality in that turn. 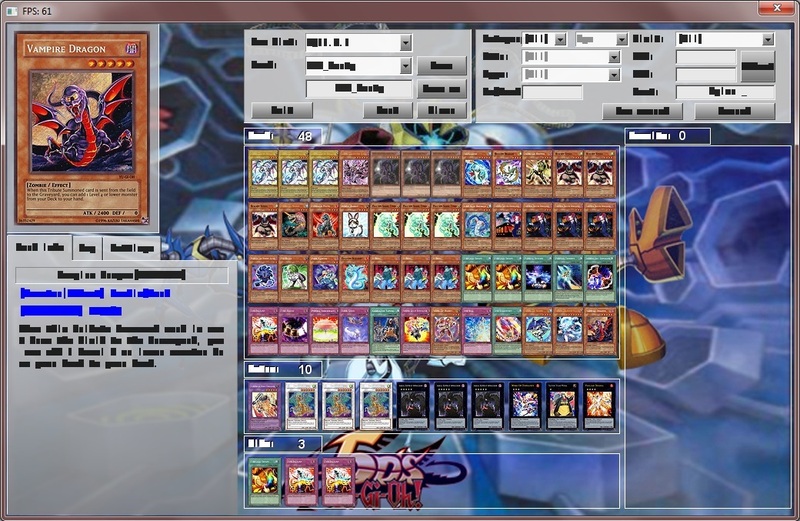 BUG 2: Phantom of Chaos cant copy the banished Darklord Zeratos effect even when there is correct target (DARK) in hand. BUG 3 : Shadow Imprisoning Mirror doesnt work on Inzektor Hornet :/ It can still equip a Cantepede on itself. yes, u know how to solve that? What happened with the hamachi room? This afternoon it gone. Why ? Have you tried the official build already? have a way of putting two soundtracks? One for the menus and one for the duels. I would be much more interesting this way, so the music would not start half at the beginning of a match. I dont use Blogspot so dunno why my post was counted as Reply. Sr.
Theres a infinit loop of Jain, the lightsworn on the sending to grave effect. I has a problem man.. When i opened the game, the font become unreadable.. It is hard for me to read the cards discription.. Is there any solution for this? Why don't you try to press R? like people like u! good job in modding! Haven't tested coz imma still downloading! First time found this..I'll share with my friends and family.! im change song in folder sound YGOpro. can i play it through laptop's wireless? because there its says got 'Lan Mode' so is it possible to connect through wireless and play? or if it can't,will there be wireless laptop lan? When summoning a ritual monster, there is a textbox that pops up saying the ritual is prepared would you like to continue? And the yes button cancels and the no button continues. yes i have. it become a bit better but still unreadable and sometimes it become worst. since most people play through hamachi or other network, it wouldn't be a matter if you use wireless or wired network. Percy Thanks for this game however. Negate Attack does do anything it does not end the battle phase and the opponent can still attack, also sometimes when you have to look at cards in your deck the screen sticks or you cannot view all of your cards and also sometimes when you make a new deck when you start a duel with your opponent the previous deck you used is switched instead. P.S can you add Graverobber's Retribution and Savage Colosseum. Hello guys, www.kc-ladder.com now has a 32 player room for all those interested in playing ranked ygopro games, come and check it out. Bugs: Magic Drain not working. Same for Negate Attack. How do i use it, like start a duel. Do i need hamachi? Please answer. I want to know how to add cards since I plan on adding anime and other custom cards on my own. Can you make a tutorial or something of the like, Percival? i need atum" and ennead"
game stop running after comp restart anyone have this problem? Can you add Tag Duel Mode in a new version? can someone answer this.. really need to fix this problem.thanks in advance. I've been experiencing the same problem.. just restart again your PC should solve this.. I cannot select deck.I try to select one when i join but i get the ''Invalid deck'' error.There aren't any forbidden cards in my deck. You cannot Normal Summon "Blackwing - Elphin the Raven" without tributing a monster despite there's a blackwing monster on your side of field. I don't know if this is a bug or I just don't know to activate its effect in-game. in the next version of the game will already have the cards of the Hieroglyph? i agree with the anonymous above >.<!plz make it playable offline thru wireless, mr percival!! not all wants to go online when friends just close!! i used wirless network to play some other game on lan mode once u just need to find each other lan ip maybe check router DHCP? Why my quality of the game is awful? :lol: are you blind? don't you see it's basically LAN based duel?? When will you release a new version? Why there is only 2 Evil HERO Fusion Monsters? What will the two currently n/a options be?I hope one of them is against a computer opponent. have you disable the firewall? I cant find "Rainbow Life"
Please put "Damge = Reptile" ? And more card for decks of reptile. the strings.conf is easily translated. for the card.cdb i'm still trying using sqllite to modify it. thank you for your great work!!! A new LIMITED & FORBIDDEN LISTS is out (MARCH 2012), so I was wondering if on your next version you can add it (http://www.yugioh-card.com/en/limited/index.html). is there a way to take back a miscilck? guys please help my chat in game not work how fix it?